Well, hello there! It's Monday again, and you know what that means - another Meal Prep Monday! 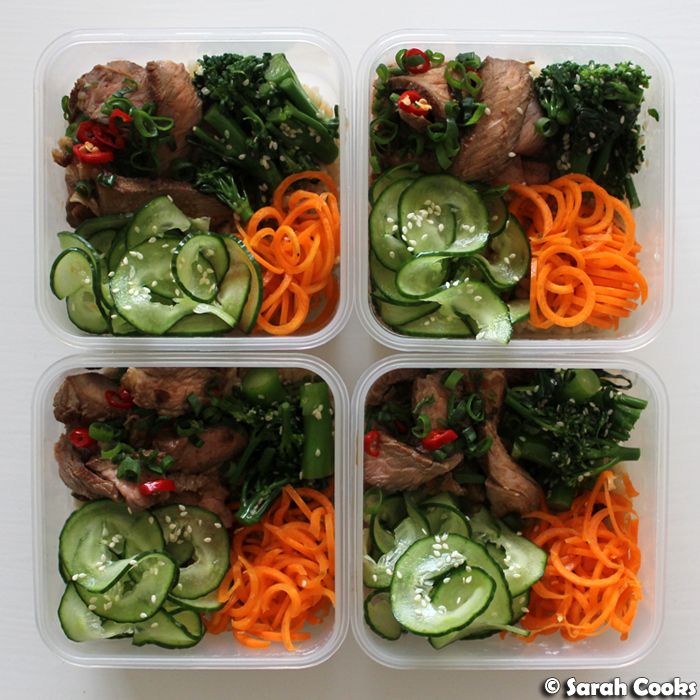 Today's meal prep is inspired by Korean flavours. 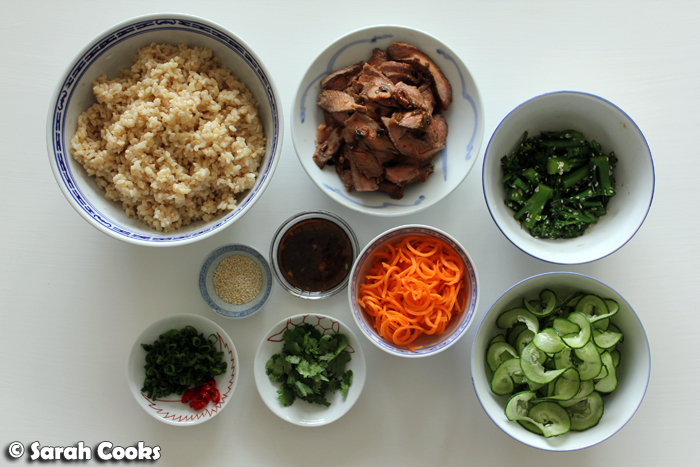 We have a base of brown rice, with marinated steak, broccolini namul, julienned carrots and finely shaved cucumber. Plus a little garnish of extra sesame seeds, fresh coriander, chilli and spring onions. Recipes are down the bottom of this post, but let me talk you through the elements right now. The beef was two beautiful steaks, marinated in a mixture of soy sauce, sesame oil, garlic, spring onions and chilli. Normally I like my steaks very rare, but because I was planning to eat it over four days, I decided to cook it through. The marinade was based on Nigella's black and blue beef (from Forever Summer), and is really delicious. 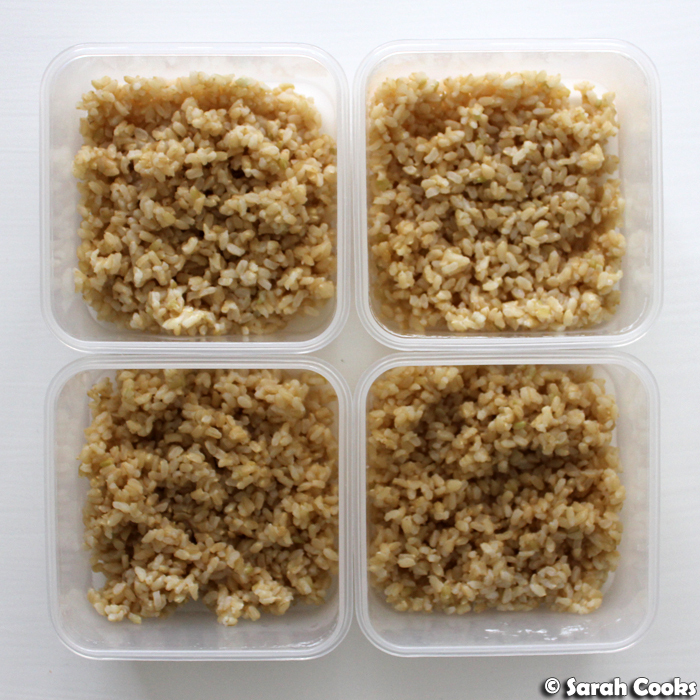 Knowing that brown rice is kinda a black hole for flavour, I decided to cook the marinade and use it as a sauce. Bonus! Ok, broccolini namul. I don't know a lot about Korean food, but as far as I can tell, "namul" is the general term for vegetables in a seasoned sauce. After Googling dozens of recipes, I decided to toss the cooked broccolini in a mixture of sesame seeds, sesame oil, garlic, soy sauce, sugar and salt. And boom - broccolini namul! Of course, kimchi would be an obvious addition to this meal prep, but I had the cucumber and carrot sitting in the fridge, and wanted to use them up. Lots of crunchy freshness there! I'm also not always in the mood for punchy flavours of kimchi, so wasn't sure if I'd handle it for four days in a row. I used brown rice for this, which was wonderfully hearty, but my preferred rice for this meal prep would have been Korean purple rice. I had a few packets in the pantry, but unfortunately they were out of date. D'oh! Next time, next time. This was such a great meal prep! Lots of different vegetables and textures, and it kept really well throughout the week. I ate it cold, straight from the container, but you could always keep the raw veggies separately and heat the rest up. Speaking of which, on the Thursday, I felt like something else for lunch (the nasi lemak craving was strong that day), so took the last lunchbox home. 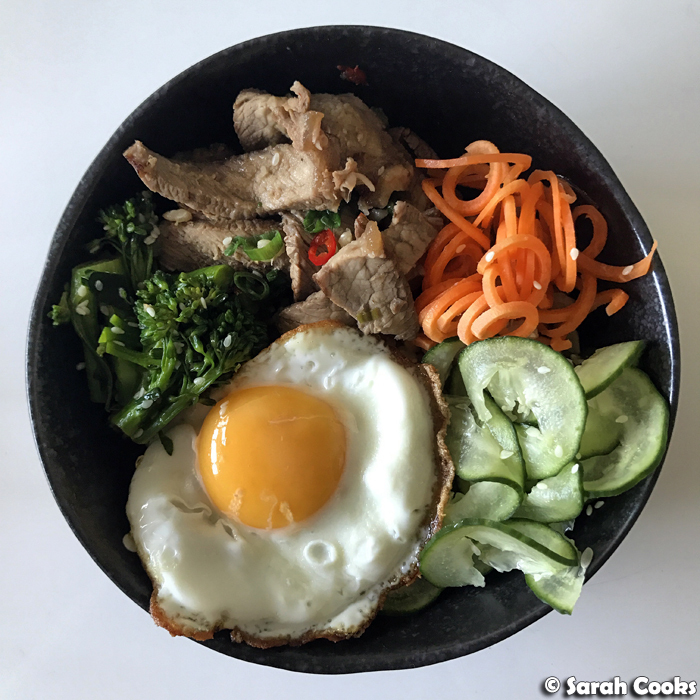 I picked out the cucumber and carrot, microwaved the beef, rice and broccolini, then reunited it all in a bowl and topped it with a fried egg. Delicious! 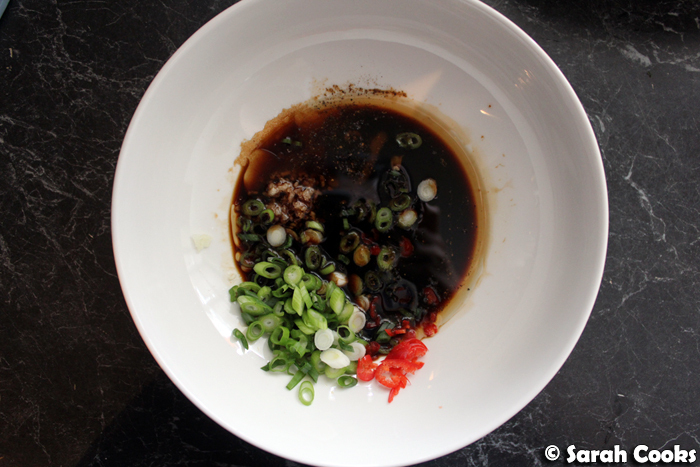 Mix together 2.5 tablespoons soy sauce, 1 minced garlic clove, 1 teaspoon sesame oil, 1 teaspoon caster sugar, a grinding of black pepper, 2 chopped spring onions and 1 chopped red chilli. Place in a shallow non-reactive bowl. 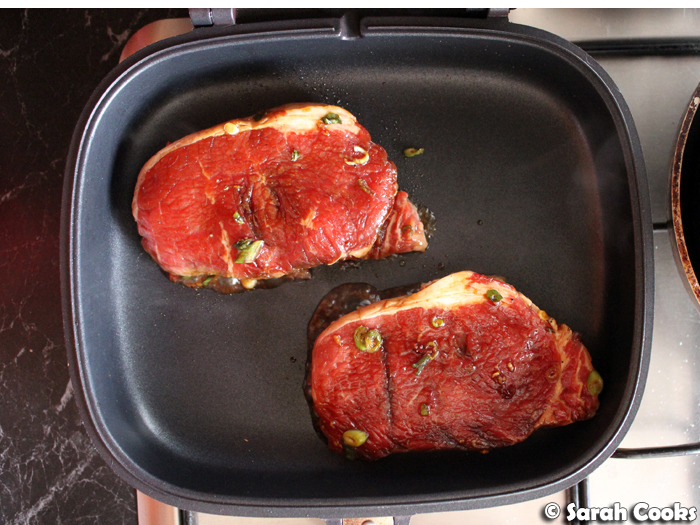 Place 2 scotch fillet steaks into the bowl, and flip them to coat in the marinade. Leave for an hour at room temperature. Heat a frying pan until hot. Cook the steaks for approx. 5-10 minutes per side, until cooked to your liking. (I generally prefer steak rare, but for meal-prep purposes I cook the meat through). Remove from the heat and allow to rest for at least 10 minutes, before slicing thinly. 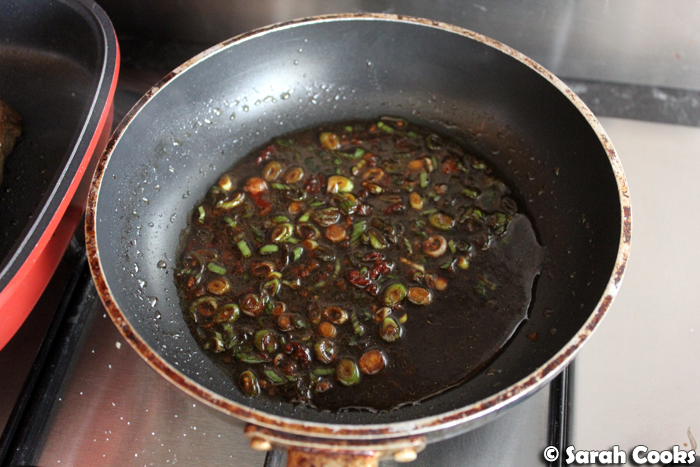 Meanwhile, place the marinade into the frying pan and heat until it comes to the boil. Remove from the heat and set aside to cool. Cut 4 stalks of broccolini into quarters. Cook in boiling salted water for 1 minute, or until tender crisp and bright green. Drain the broccolini and run under cold water to arrest the cooking. 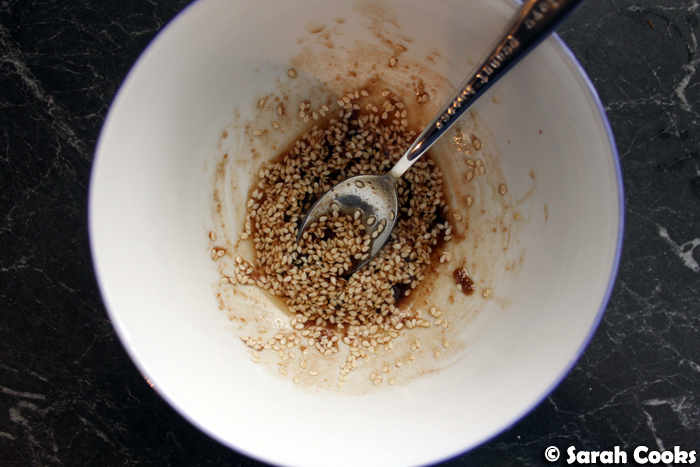 Mix together 1/4 teaspoon crushed garlic, 1/4 teaspoon soy sauce, 1/4 teaspoon salt, 1 teaspoon roasted sesame seeds, 1/4 teaspoon caster sugar and 1 teaspoon sesame oil. Toss through the broccolini pieces. Wow, I'm not usually a blog reader. I came for the German cheese cake- and read for hours. I LOVE your food and your style and the blog Thank You! I'm excited to try cooking the cheese cake tomorrow-I lost my Oma's recipe. Oh what a lovely comment! You've just made my day! And such a coincidence - I'm actually making the German cheesecake tomorrow for the first time since I blogged it! Hooray!